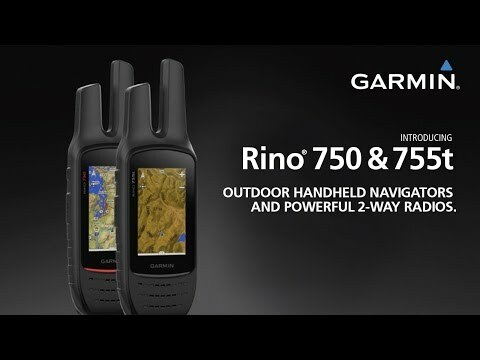 With communication, navigation and a camera, the Rino 755t is like a smartphone for your off-grid adventures. Preloaded with 100K resolution TOPO maps for Canada, it simplifies backcountry navigation and trip planning. The 8-megapixel camera means you can take pictures of your adventure without needing to carry another device. Each picture you take is automatically geotagged with location data via the quad-helix antenna’s excellent GPS reception. Free BaseCamp software lets you map out your adventures and pins your photos on the map. The integrated FRS/GMRS radio lets you stay in contact with other Rino units in your party, so you can communicate via talk or text without needing cell reception. Share your location with other Rino users to take the guesswork out of meeting up in the backcountry. Before heading to the trailhead, pair your device with a smartphone running the free Garmin Connect app to unlock even more potential, including real-time weather tracking, satellite terrain imagery, trip planning, fitness modes, and much more. 2 Watt FRS/GMRS 2-way radio lets you communicate by voice or unit-to-unit texting regardless of cellular signal (range: 3.2km FRS and 32km GMRS). NOAA and S.A.M.E. technology (Specific Area Message Encoding) prevent you from missing a weather alert. Alerts are only active when the weather radio is on, and you are on an active radio channel. Active weather provides real-time radar tracking (via a connected smartphone running Garmin Connect), which allows you to stay one step ahead of bad weather. 8-megapixel camera with a 4x digital zoom lets you record your adventures with geotagged images. Find your friends by sending other Rino users your exact location and viewing theirs on your map screen. Free Garmin Connect mobile app allows you to customize your Rino experience, choosing which widgets to show and when, reviewing stored activity data, selecting which apps can push notifications, and more. Connect IQ support allows you to download apps, templates, data fields and other features. Free BaseCamp navigation software lets you view and organize maps, waypoints, routes and tracks. BaseCamp will even place your geotagged photos on the correct map locations. BaseStation combines the power of BaseCamp with that of your laptop, acting as a full command centre that's capable of tracking multiple Rinos. View real-time GPS information on the larger display of your computer while the Rino serves as an antenna, meaning you're not dependant on internet or cell service. Compatible with Garmin Custom Maps, a free service that allows you to transform paper and electronic maps easily into downloadable maps for your device. Bluetooth Smart and ANT+ compatibility allow syncs with compatible activity sensors and accessories. Send smartphone notifications straight to your Rino via the Bluetooth connection to your paired smartphone. Auto-rotating screen lets you mount your Rino horizontally or vertically. Integrated quad-helix antenna for enhanced signal reception from GPS and GLONASS satellites. Barometric altimeter helps you track your ascents, descents and total elevation changes. Tilt compensated 3-axis electronic compass shows your heading even when you are stationary, ensuring that you're always facing the right direction. IPX7 waterproofing protects your Rino from even the heaviest downpours. LED flash can double as a flashlight, should you get caught in the dark. Rechargeable lithium-ion battery lasts up to 14 hours with all modes active. Extend your power supply options with the AA battery pack option (sold separately), which accepts one of the most globally available batteries. Free 1-year subscription to BirdsEye Satellite Imagery allows users to download satellite images. In the box: Rino 755t preloaded with 100K TOPO Canada maps, 1-year BirdsEye satellite imagery subscription, lithium-ion battery pack, USB cable, AC charger, carabiner clip, documentation.